We are leading manufacturer, exporter and supplier of Spare Parts for Stenter Machine like Stenter Clips Parts with international standard from last 25 years from India. We are engaged in manufacturing and exporting Stenter Clips for all stenters from last 25 years. This clip can exhibit an excellent performance as a high speed clip. Our Stenter Chips are designed for the finishing of cloth which have hard tension. Also featuring as, Roller chain made of reinforced steel is capable of running at high speed and temperature for long life-cycle. Clip is casted from special alloy aluminum. Plus special treatment makes required hardness and slick surface for easy maintenance. 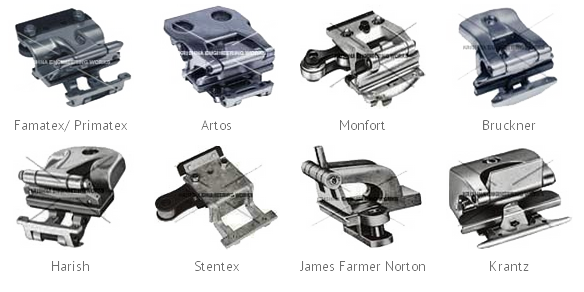 We are leading manufacturer, exporter and supplier of Spare Parts for Stenter Machine, Stenter Clip, Stenter Machine Clip Manufacturer, Stenter Pin Bar, Stenter Pin Block, All type of Stenter Machine Spare Parts, Textile Machinery Spare Parts Manufacturer.